Toolik Lake is 130 miles south of Prudhoe Bay in northern Alaska. 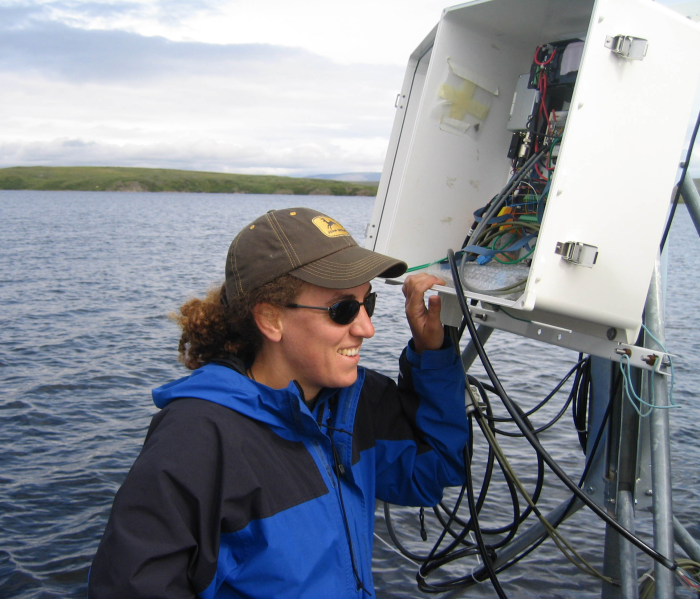 It is one of the main monitoring sites of the Arctic Long-Term Ecological Research (LTER) project and a site for studies led by Sally MacIntyre of the University of California investigating the linkages between hydrodynamics and ecosystem function. Both studies are funded by the U.S. National Science Foundation. It is classified as a dimictic lake, meaning a lake that undergoes two mixing periods—one in the spring and one in the fall. The lake is thermally stratified during the summer since the sun warms the upper layers. A thermocline (a layer with a rapid change in temperature) separates the warm upper layer with the cold deeper layers. The lake is ice-covered in winter. Toolik Lake is a Global Lakes Ecological Observatory Network (GLEON) site. At present, there are 22 sites worldwide, with new members joining each year. The goal is for all sites to be instrumented with thermistor chains combined with meteorological stations, transmitting data in real time to a central computing facility. Ideally, oxygen will also be measured in real time at these sites. In an effort to better understand Lake Toolik's mixing dynamics, a T-Chain (vertical series of temperature sensors, from Precision Measurement Engineering, Inc.) was installed in conjunction with a Campbell CR10X datalogger. (The T-Chain can also interface with our CR1000 and CR800 dataloggers.) The T-Chain and logger collect real-time, continuous temperature data at a series of depths, with an accuracy of plus or minus 0.01 deg C. The real-time data from Toolik Lake during the summer of 2008 can be seen at www.icess.ucsb.edu/biogeo/toolik1/toolikRT.html, and will be updated again when data collection resumes in the summer of 2009. For several reasons, researchers are interested in monitoring the thermal stratification in Toolik Lake, as well as its mixing dynamics. One reason is that the most dramatic climate change is anticipated in the Arctic region, and temperature data are required to document the changes. Another reason is that winds create internal waves in stratified lakes. If the winds are strong enough relative to stratification, the internal waves will break and cause nutrients, regenerated in near-bottom waters, to mix vertically. If the quantity of nutrients mixed vertically in the lake is large enough, phytoplankton growth rates will increase. Thermal stratification measurements are essential in order to quantify the productivity of lakes and to predict how the productivity will change over time. The amplitude and shape of internal waves are evident when multi-depth, time-series temperature measurements have been made. Similarly, these measurements allow users to compute the coefficient of eddy diffusivity, a parameter indicative of the amount of turbulence in a lake and critical for computing nutrient flux. A third reason is that scientists are interested in the mixing dynamics of lakes of different sizes and in different latitudes. Time-series temperature measurements, coupled with measurements of surface meteorology, allow scientists to decipher the different dynamics in lakes in different regions. This knowledge will allow greater prediction of the quality of inland waters under changing climate regimes and with changes in land use. Researchers are also interested in time-series oxygen measurements paired with temperature measurements. These measurements allow scientists to quantify the metabolism of a lake, that is, how much the phytoplankton and bacteria are growing. Changes in oxygen at different depths are also indicative of remineralization, the process which transforms organic matter to inorganic nutrients. In addition, time-series oxygen and temperature measurements are essential for determining how much of a lake is suitable for the growth and survival of fish. For example, with high loading of nutrients or insufficient mixing, oxygen depletion occurs at depth, causing a loss of habitat suitable for fish. This problem may be exacerbated by a changing climate. We're active on social media! Kristen Head, Precision Measurement Engineering, Inc.